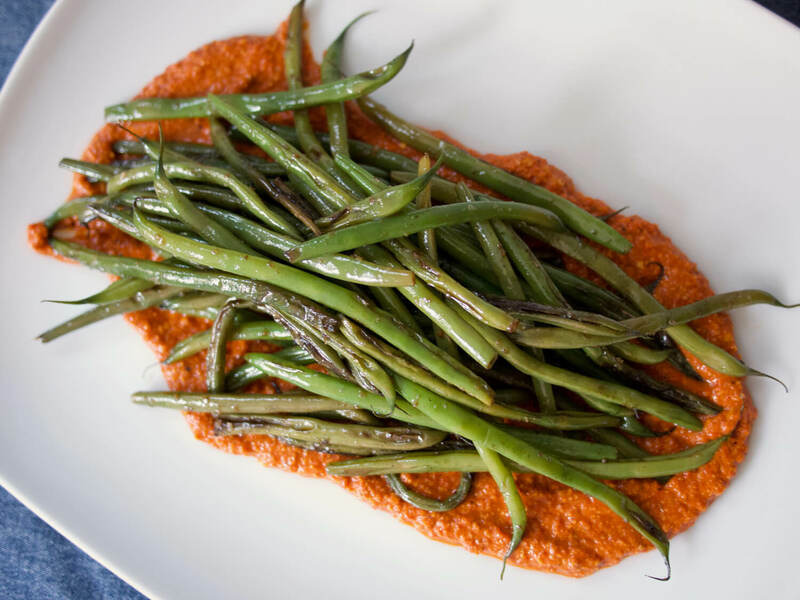 Romesco, a classic Spanish sauce of pureed roasted peppers, spices, nuts, and vinegar, goes beautifully with every kind of vegetable, raw and cooked - here it's paired with garlicky green beans cooked low and slow in butter for a beautiful browned flavor. There are two parts of this recipe that you'll want to add to your regular rotation after you make it. First, the romesco sauce - just as easy to make as pesto in the food processor, and an immediate flavor boost to any vegetable dish with it complex combination of the sweetness of roasted peppers, the nuttiness of almonds and hazelnuts, the bite of red wine vinegar and garlic, and the depth that Vanns Smoked and Sweet Spanish Paprikas bring to it all. And second, the method of cooking the green beans. These aren't the al dente kind that you're used to seeing in a niçoise salad, still snappy and bright green, but they're not the kind that have been cooked to death either. Instead, they're browned in butter to develop flavor and then cooked low and slow in their own juices until perfectly tender. Garlic added at the very end gives a lift to their earthy, sweet flavor, and unites them beautifully with the romesco sauce smeared on the platter beneath. You can always make the romesco without the beans and the beans without the romesco! But give them a try together at least once for a beautiful side dish that looks like it took more effort than it really did. First, roast the peppers for the romesco. If you have a gas stove, place peppers directly over flame and roast, turning occasionally with tongs, until skin is charred all over. If you only have electric burners, place peppers in a rimmed pan that will fit under your broiler and broil on high, turning occasionally, until charred all over. A gas grill can also be used, if that's convenient. Place charred peppers in a bowl and cover. Allow peppers to cool to room temperature while you measure other ingredients - cooling the peppers covered makes the skin a bit easier to remove. Place hazelnuts, almonds, smoked and sweet paprikas, garlic cloves, olive oil, vinegar, and 1 tsp. sea salt in the bowl of a food processor. When peppers are cool, remove the stems, peels, and seeds, working over a bowl to catch any juices that are lost. Add peppers and juices to the bowl of the food processor and pulse until all ingredients are combined but the mixture is still a bit chunky. Taste for seasoning and stir in more salt if desired. Keep at room temperature until ready to serve. You'll end up with more romesco than needed to serve with the beans -- keep in the fridge for 1 week and serve with eggs, on toast, or with other types of vegetables. To make the beans, melt butter in a skillet with a tight-fitting lid over medium-high heat. When fully melted, add the beans and toss with the butter, then cook, stirring occasionally, until they begin to brown, 5-10 minutes. Reduce the heat to low, cover the skillet, and cook until the beans are very tender, stirring occasionally, 15-20 minutes. Stir in the garlic and remove from heat. Sprinkle with salt to taste. Spread some of the romesco in a thick layer across a serving dish and arrange beans on top. Serve warm. It may be September, but barbecue season isn’t over yet! While the weather’s still warm, and friends are still throwing meat and vegetables on the grill, it’s time to give this hearty, crowd-pleasing side dish a try. You’d never think that beans could be a showstopper of a dish, but these have the perfect balance of sweet and tangy, smoky and spicy. It’s starting to feel like real springtime weather these days -- cool in the mornings and evenings, warm during the day, weather that sometimes makes it hard to know what to eat. A cool, refreshing, summery salad or a comforting, warming wintery stew?